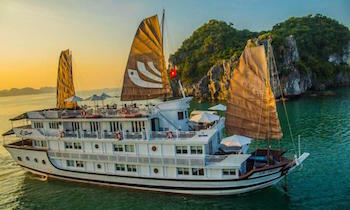 For those who love nature and exploration, 3 days on cruises on Halong Bay are very ideal with a variety of activities to experience and places to go. 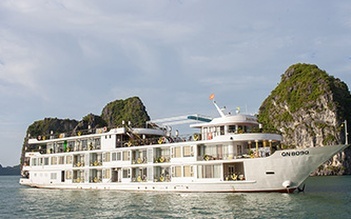 Staying overnight on cruises in Halong Bay is increasingly being chosen by tourists and gradually becoming preferred because it gives visitors interesting feelings and unforgettable experiences. 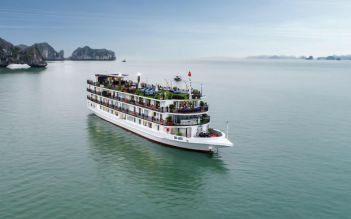 Compared to the 2-day Halong Bay cruise tour, the 3-day tour, apart from Halong Bay, will take visitors to many further locations in Bai Tu Long Bay, Lan Ha Bay, and Cat Ba island which are less crowded than many famous areas. 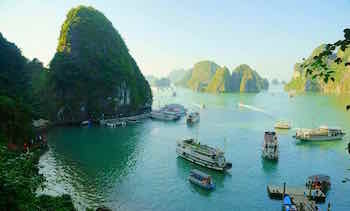 Therefore, besides exploring Halong nature, tourists will have an absolutely relaxing and private beach vacation here. Cat Ba island is situated in the south of Halong Bay. Cat Ba National Park has been recognized by UNESCO as a world biosphere reserve with a rich and unique biotic population, very suitable for tourists to visit, relax, and explore. Cat Ba National Park is a special-use zone of Vietnam, a biosphere reserve of the world, so there are many rare and precious animal and plant species. 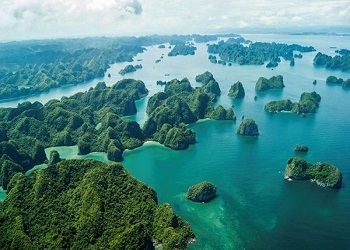 It is a combination of many ecosystems including evergreen limestone forest, highland riparian forest, coastal mangrove forest, sea forest with near-shore coral reefs, cave systems, valleys, and residential areas. 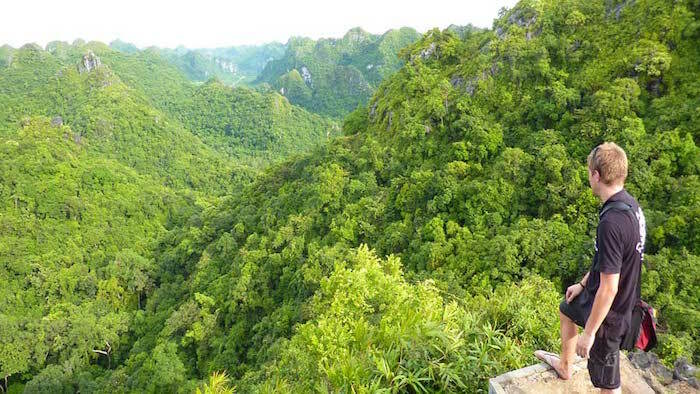 Basically, on a 2-day tour, travelers will only have enough time to visit some of the most popular spots in Cat Ba like Ao Ech or Military Hospital cave, but with the 3-day tour, travelers will have a chance to make a trekking tour through the rich forests here. Along the routes, tourists will be surprised by the wide natural beauty and the airy atmosphere in Cat Ba National Park. The cave is divided into two main compartments. The whole first compartment is like a large and spacious theater with the ceiling covered with a silky "velvet carpet", and countless "chandeliers" with glowing stalactites, stone statues, etc. Entering the second compartment, visitors will see a brilliant stream of light rushing into. The cave opens a completely different and vast landscape that can accommodate thousands of people. To the highest point of the cave, suddenly a royal garden opens before us, which has charming nature of a clear lake, all kinds of plants such as Chinese banyan, cycas revoluta, ancient banyan tree, etc, and many kinds of bird. 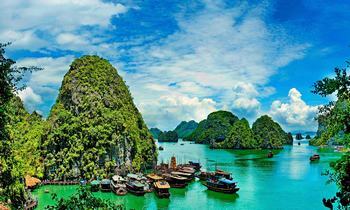 Lan Ha Bay is a beautiful bay situated in the east of Cat Ba island and the south of Halong Bay. With wide and pristine nature of hundreds of islands, Lan Ha Bay is a preferred option for those who love to have a private and peaceful space on the beaches. With the 3-day tour, visitors will be taken to many quiet beaches on islets of Da Chong, Con Vit, Hon Guoc, Hon Doi, or Tra Bau. 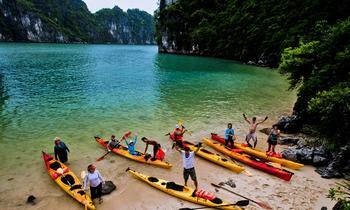 These locations are considered a heaven for travelers to go kayaking and immerse in the sea. 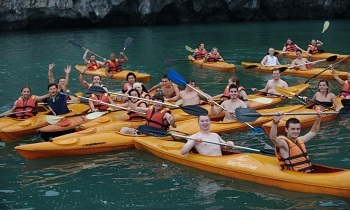 Lan Ha Bay is also an ideal place for climbing with various rocky islands. Climbing on the mountains on the sea will bring to visitors a special and unique experience. From the top, travelers can admire the panoramic Lan Ha Bay, Halong Bay and feel the fresh space, the cool breeze of the sea. There are many tour organizers supply the services of climbing in Lan Ha Bay, so if tourists are passionate about this special kind of sport, they can ask the cruise to be able to enjoy it. 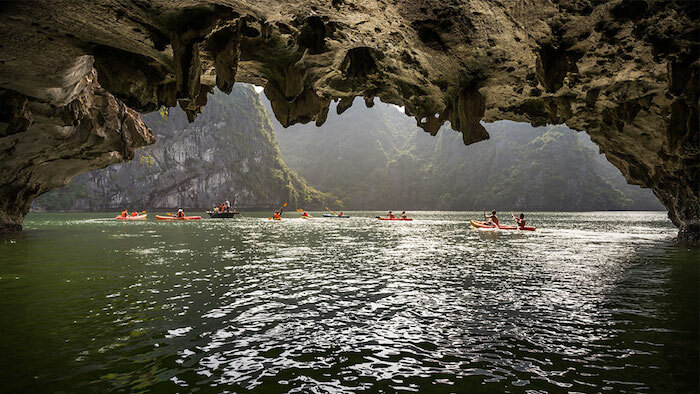 Light and Dark caves are the ideal destinations for those who like kayaking. Light and Dark caves are located on the romantic Lan Ha Bay in Cat Ba island. This is regarded as the underwater Sung Sot cave because the formation of the cave is not above the water like other caves. Besides the beautiful beaches, majestic rocky islands, and mysterious caves, Halong Bay is also famous for the ancient fishing villages. Vung Vieng fishing village is located peacefully in the pristine water area reflecting many islands. This is a floating village hidden in itself cultural and historical values with a stable population living long time ago. Tourists visiting Vung Vieng will have the opportunity to experience daily life with fishermen. 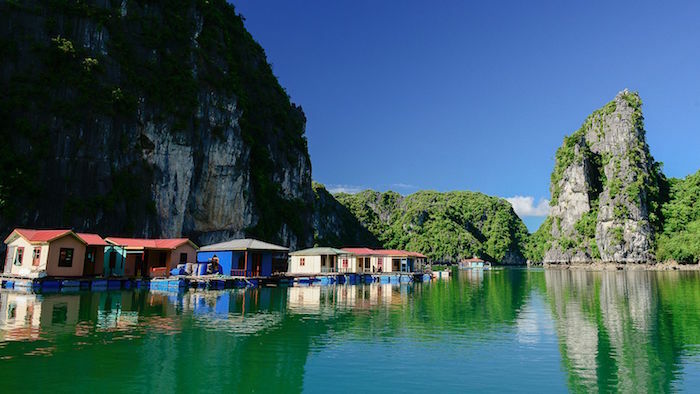 Otherwise, a tour to Tra Bau floating village will help tourists have a chance to enjoy the floating moments on Halong Bay, kayak on Lan Ha Bay, and enjoy a fresh seafood party on the raft house of Pirates Treasure. 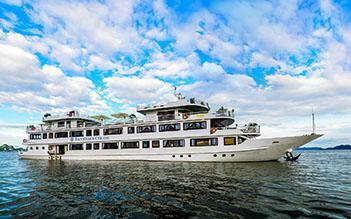 Hope that with a cruise tour of 3 days 2 night, visitors will have a wonderful time in all the attractive sites of Halong Bay. 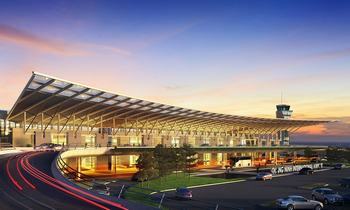 Feel free to contact us or visit our website for further information. If the article is useful for you, don’t hesitate to like and share it with others. Thank you.